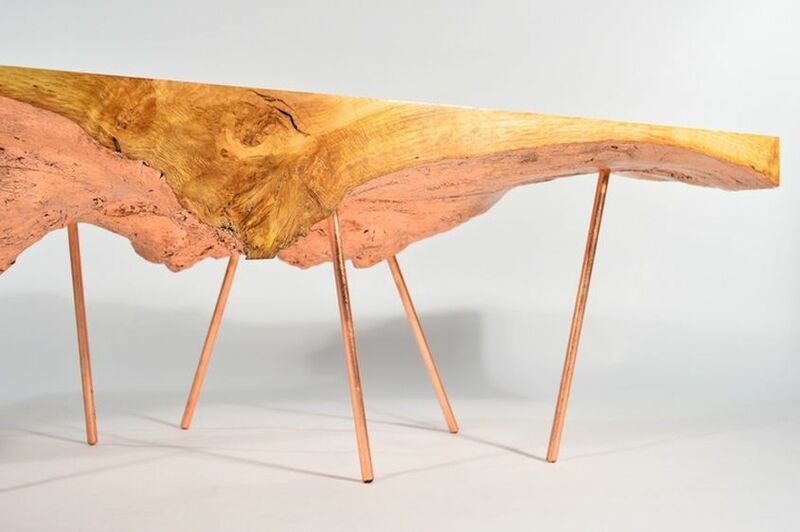 Modern classic furniture showcasing the natural beauty of burled, knotted or salvaged wood, (what we call as live edges) has become increasingly popular. 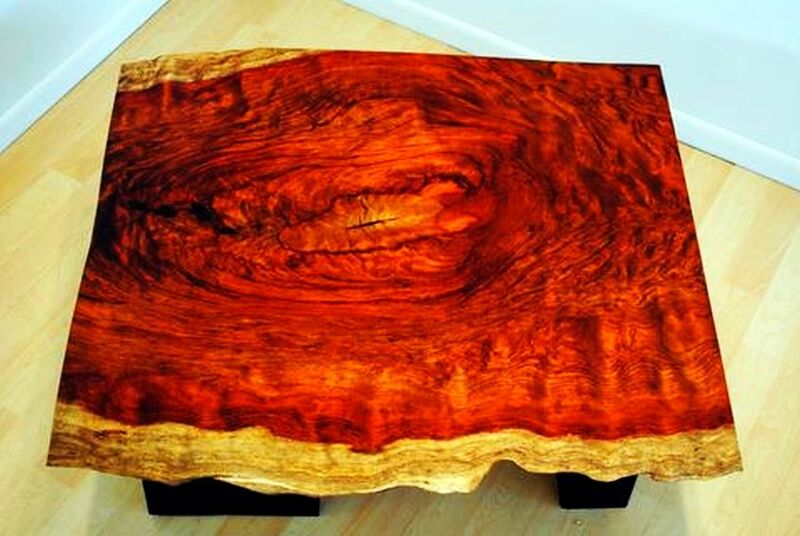 Live edge wood can be used in different ways, however, coffee tables are the most commonly used furnishing. 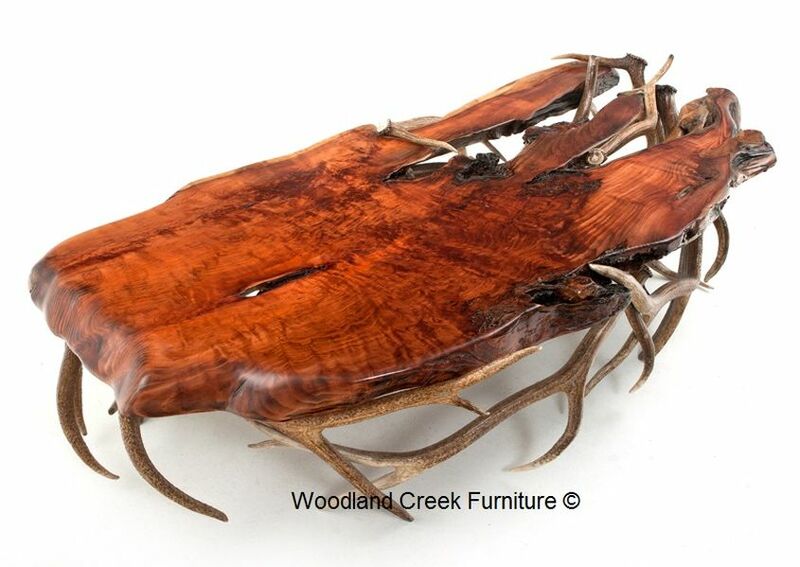 Designers can customize live edge coffee tables according to desired requirements, and there are choices for wood and finishing too. 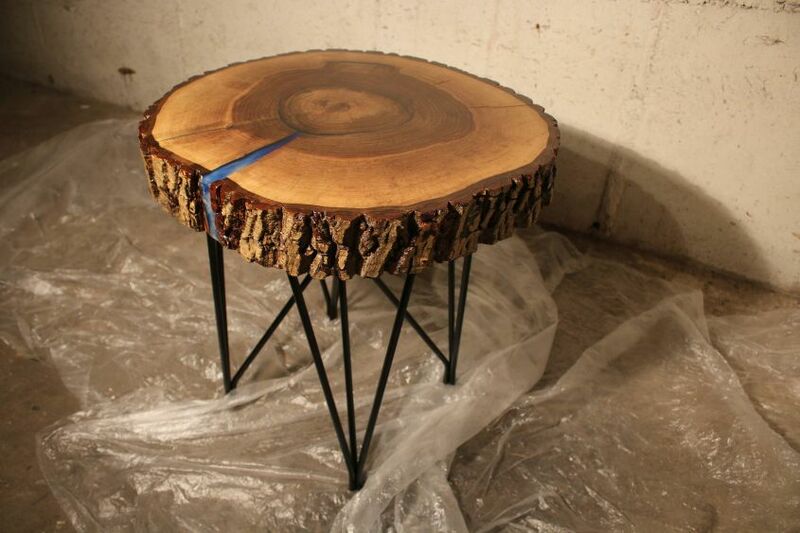 Live edge coffee tables can be categorized into two main groups: wood slab and tree round tables. 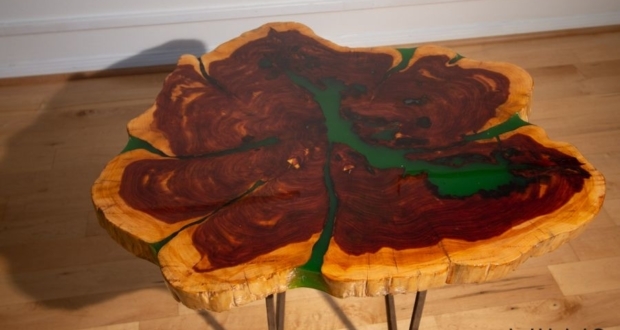 It means some are made from longer wood slabs, while others are made from slices of a tree trunk and burl anomalies. 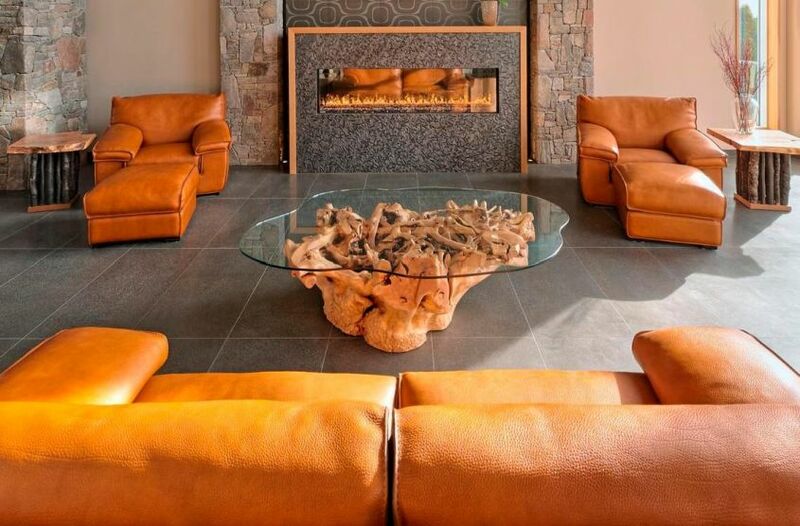 There’s no doubt that all of them are worthy additions to any home, but they boast varying aesthetics too. 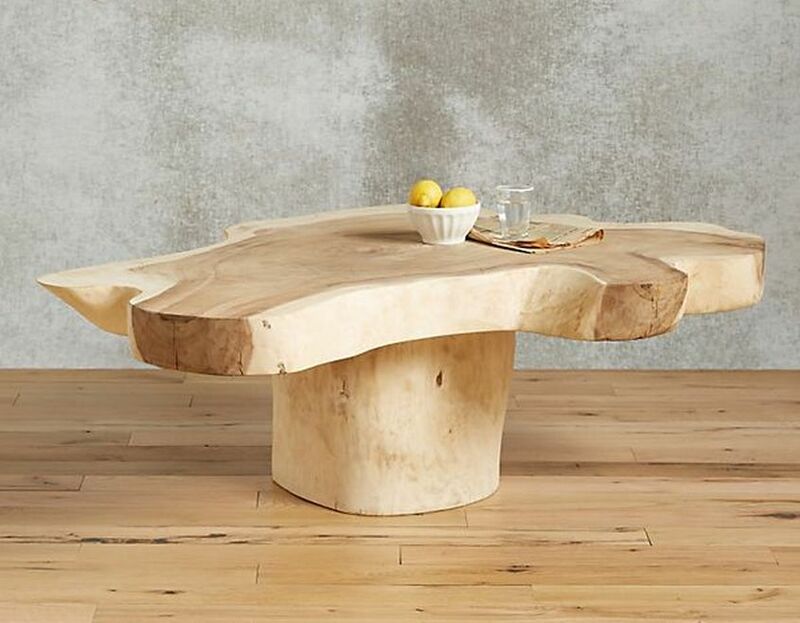 The ongoing trend of making “live edge furniture” might see a slight decline this year as some designers like Michael Berman want 2018 to be the year of fine woods with simple edges. 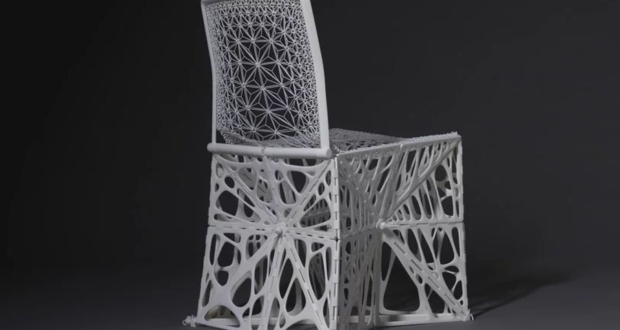 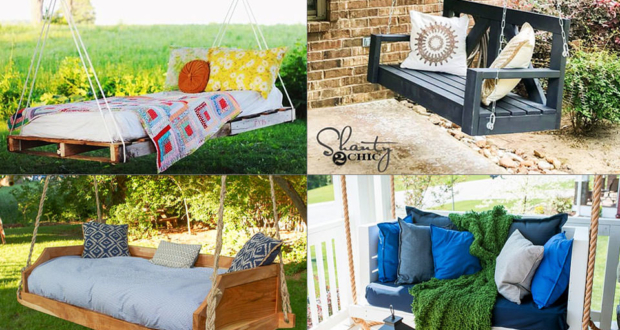 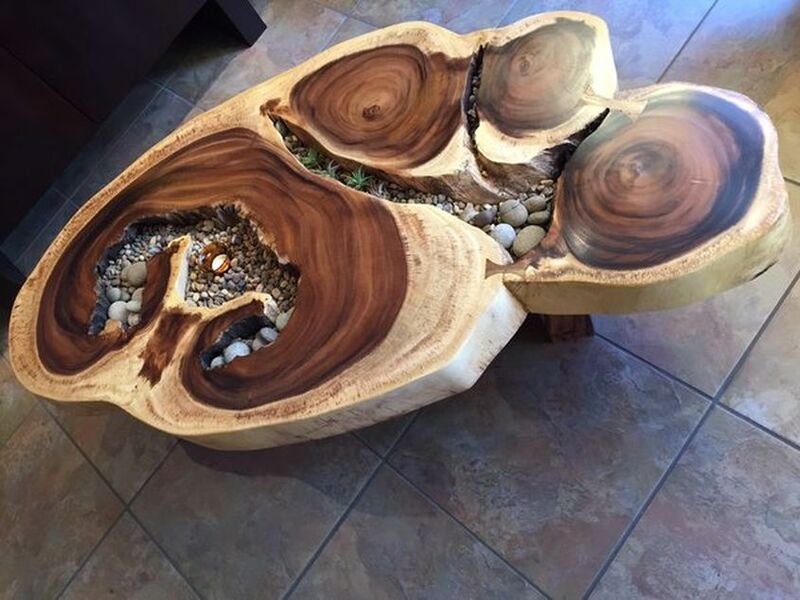 However, there are thousands of people who love and want to include such organic furnishings in homes. 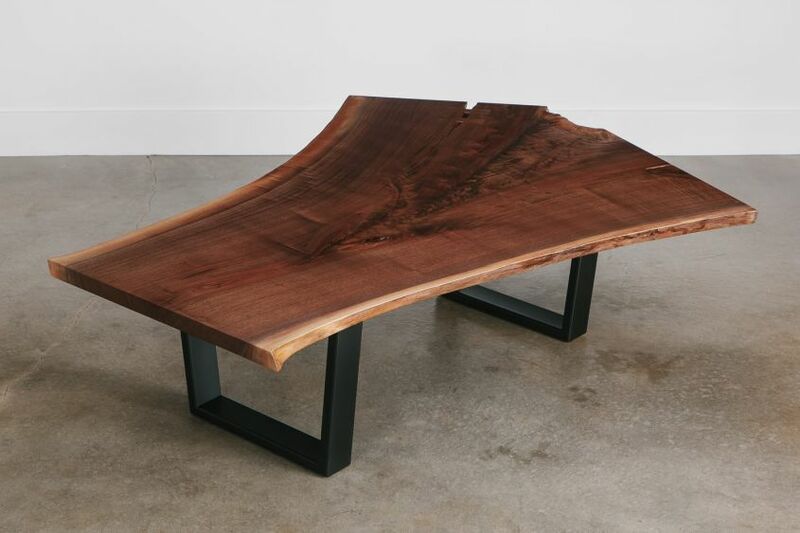 And that’s why we have compiled a thorough collection to apprise them all with some of the most unique live edge coffee tables made by different designers or DIY’ers. 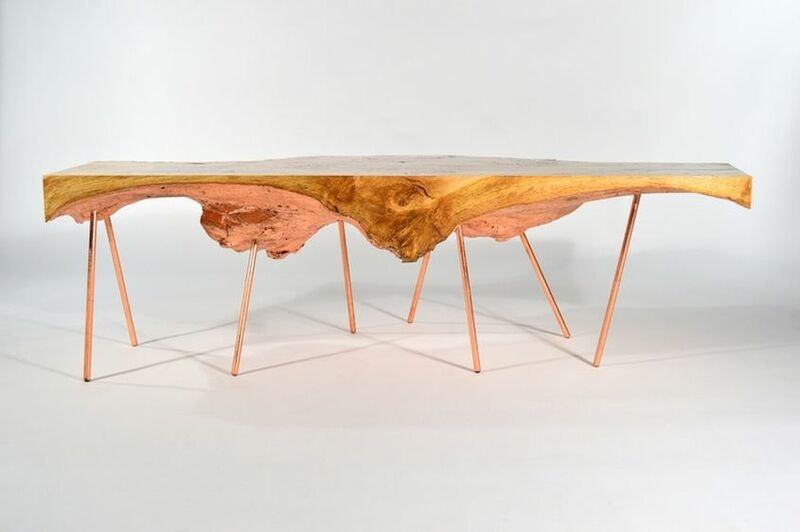 Made by Quixotic Bespoke, this luxurious live edge coffee table features a copper gilded base which deliberately compliments the burr oak tabletop. 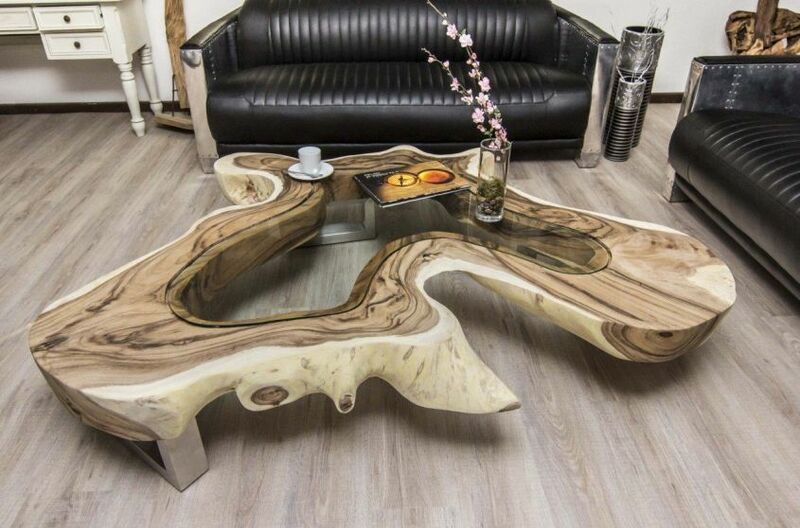 The coffee table stands on eight thin legs. 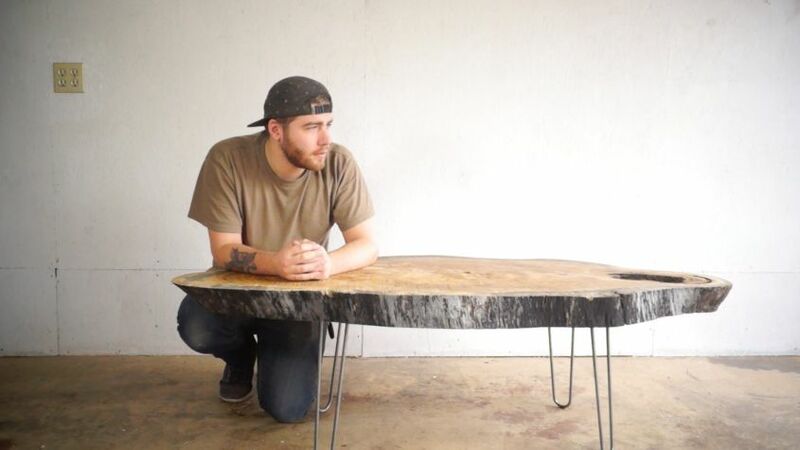 This coffee table is made from a thick live edge black walnut wood plank. 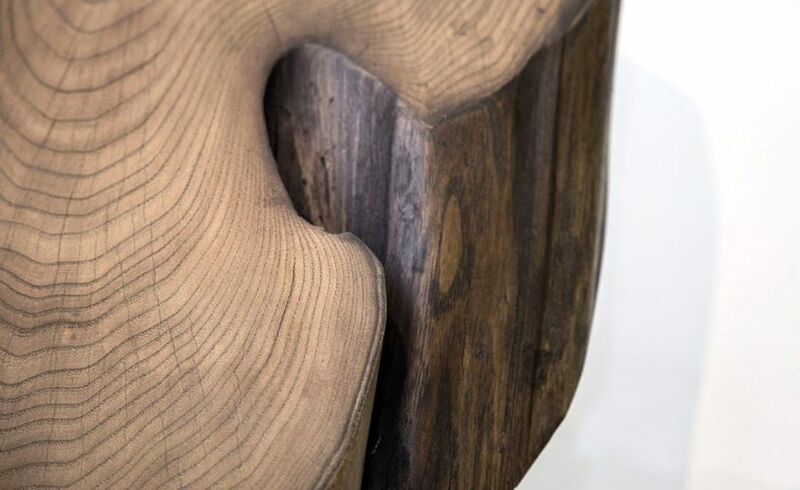 The continuity of grains adds unique essence to the furniture piece. 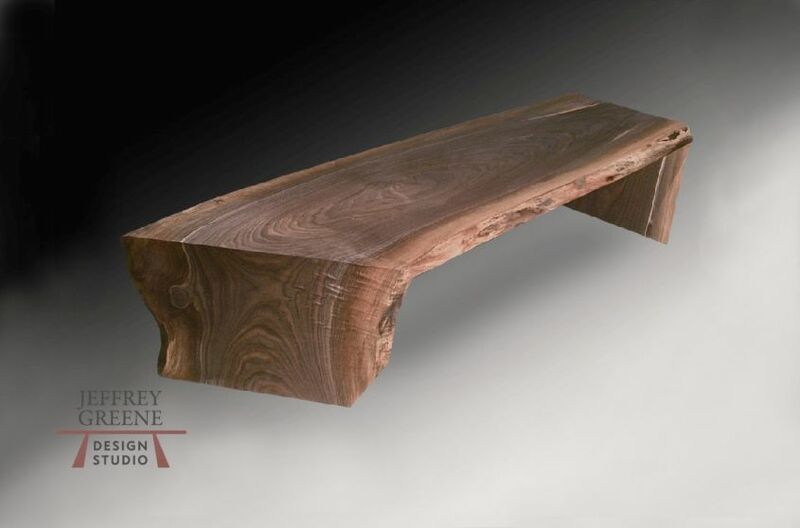 There are various wood slab options to match your specific design aesthetic. 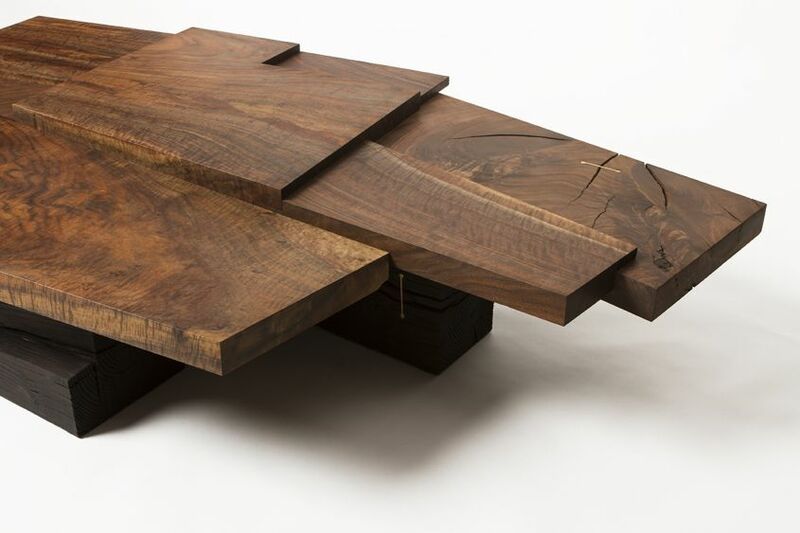 Made from a single walnut wood slab, this modernist live edge coffee table sits on a TIG welded, steel trapezoid base. 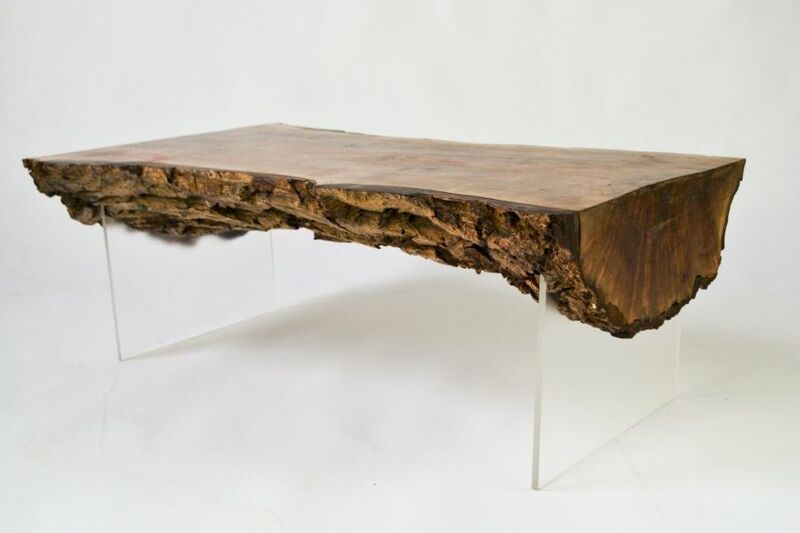 The wood slab tabletop has splits and cracks which are kept intact using handcrafted butterfly joints. 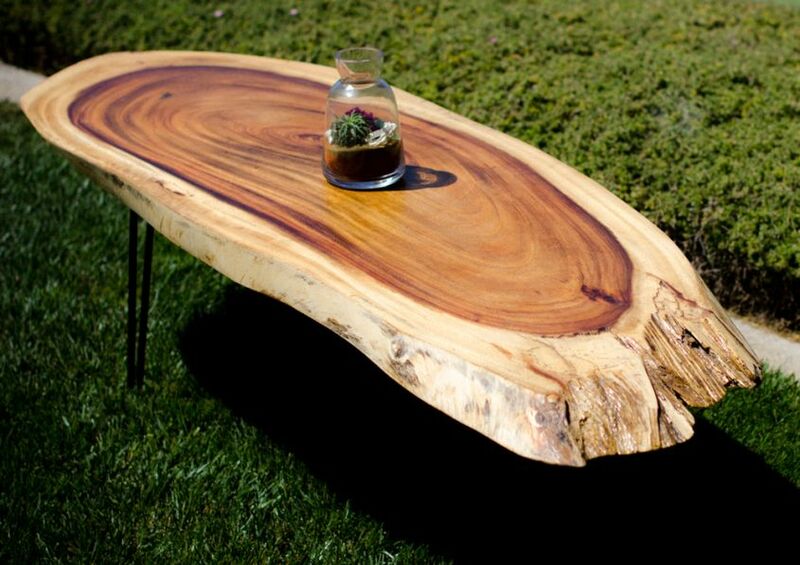 This handcrafted coffee table features a round live edge tabletop finished with hard oil wax. 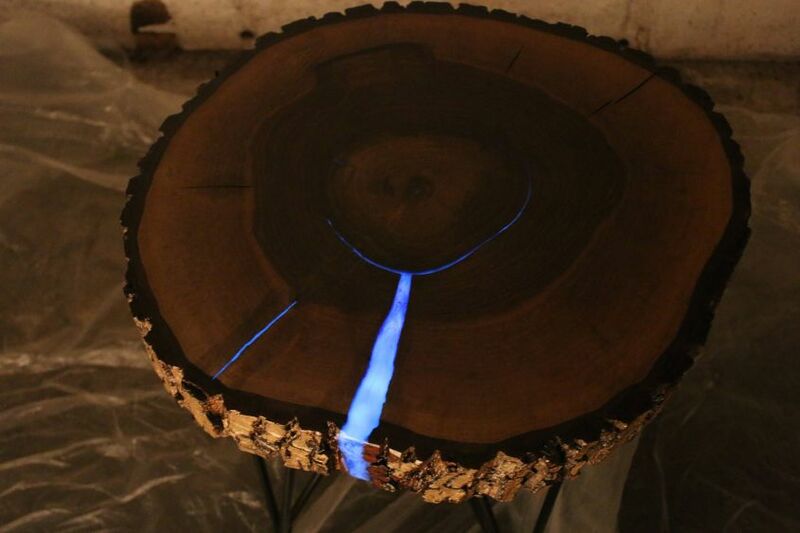 The blue epoxy resin in the cracks of the tree slice glows like a water body in the dark. 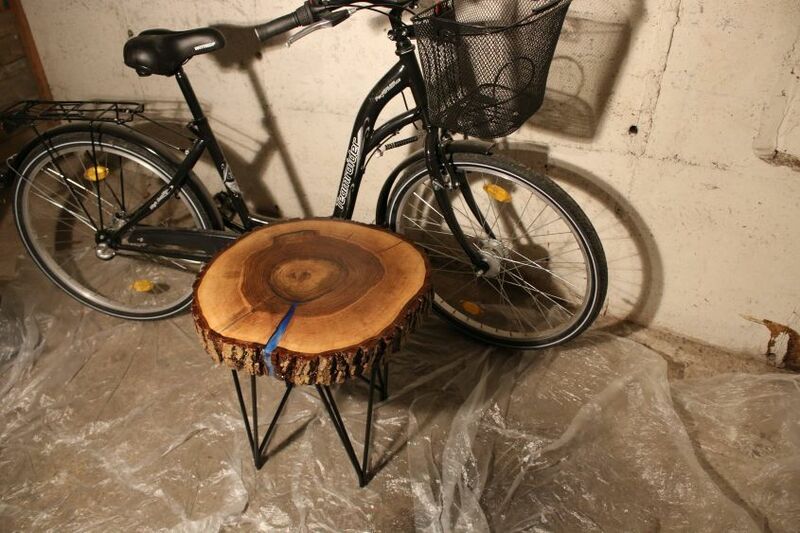 The bark is left untouched for a more natural appearance. 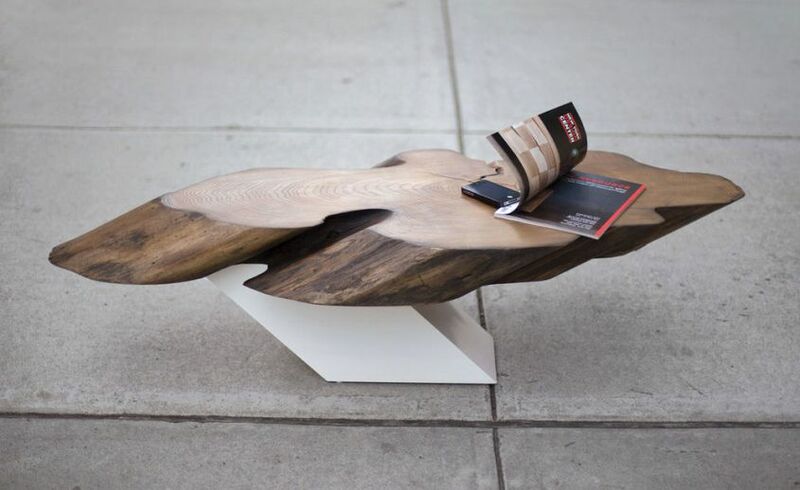 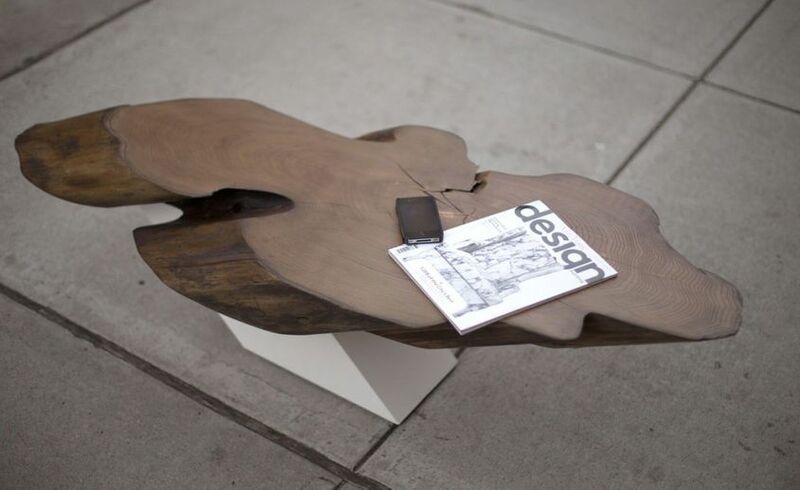 This sculptural coffee table is made from uniquely shaped pieces of maple trees that can’t be turned into slabs. 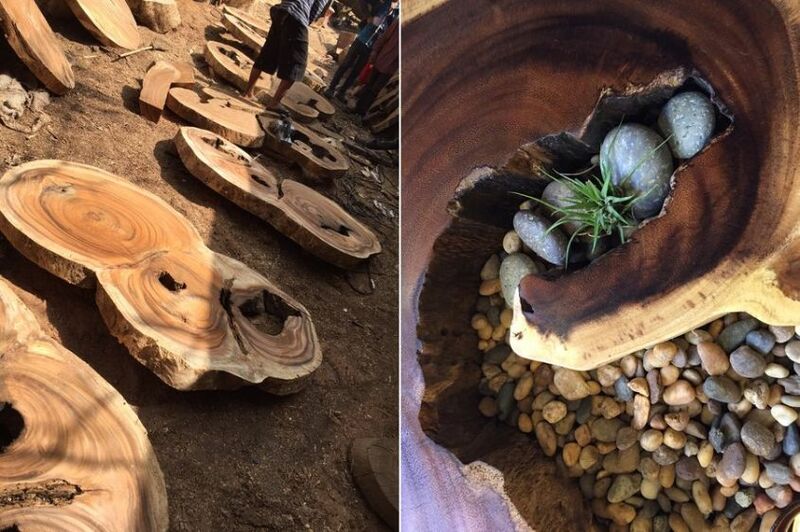 With round glass tabletop and commercial grade finishing, these funky tree chunks are able to bring a naturalistic flair to any space. 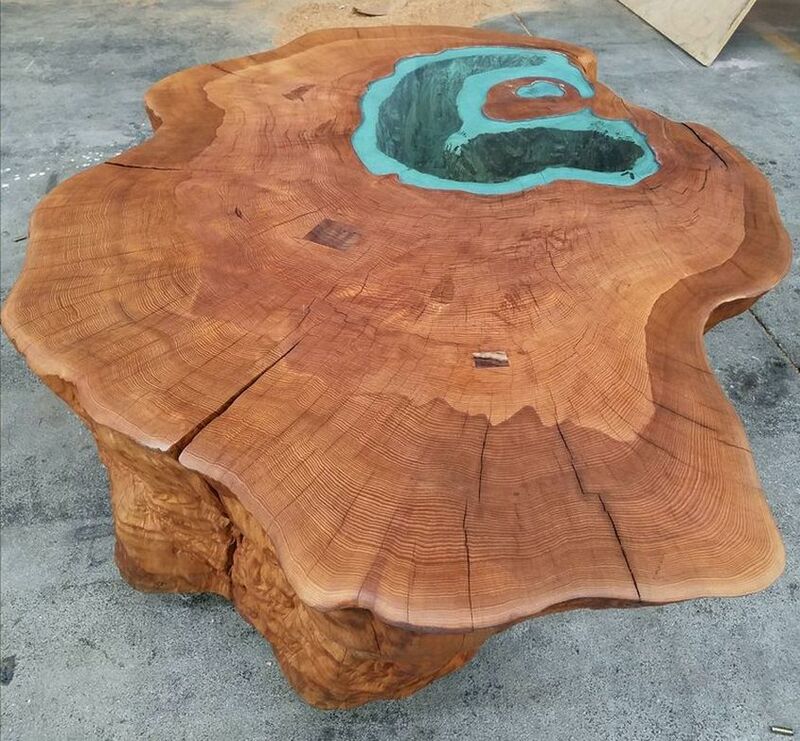 Made by Brent Graham Workshop, this one-of-a-kind live edge coffee table is made from a Lake coffee table from a giant 400-year-old tree trunk. 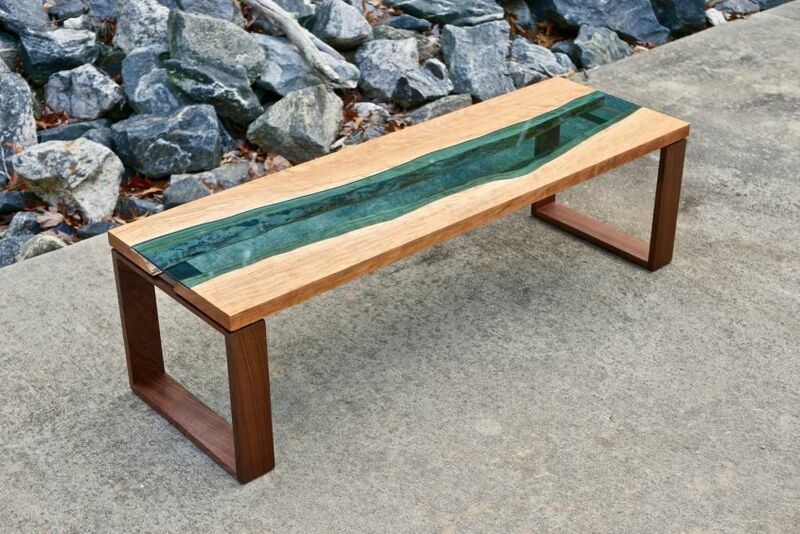 It features a teal lake, which is actually a piece of blue-green glass insert inlaid into the tabletop. 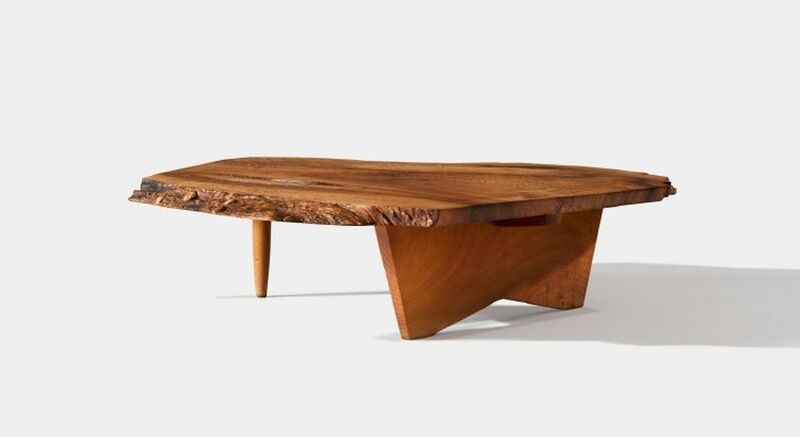 Made by legendary furniture maker and architect George Nakashima, this low coffee table is made from live edge walnut wood slab. 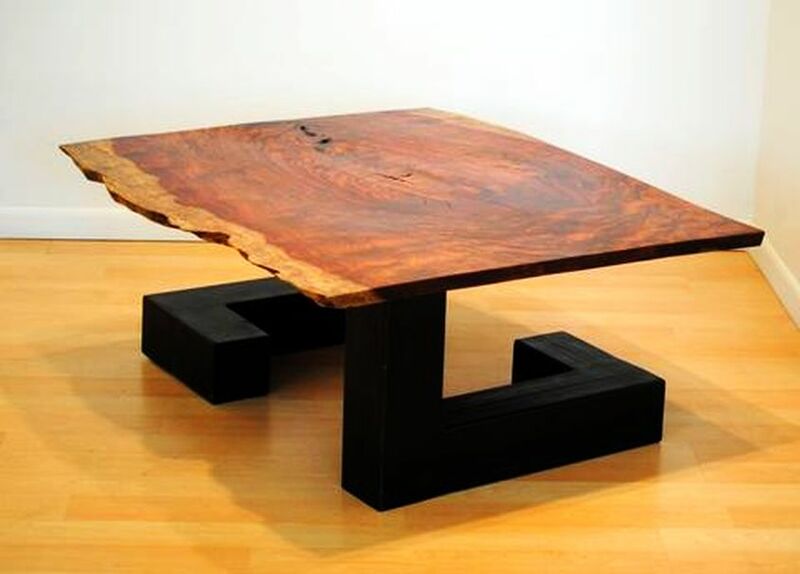 The thick tabletop has two large rosewood butterflies, free edges, knots, and fissures. 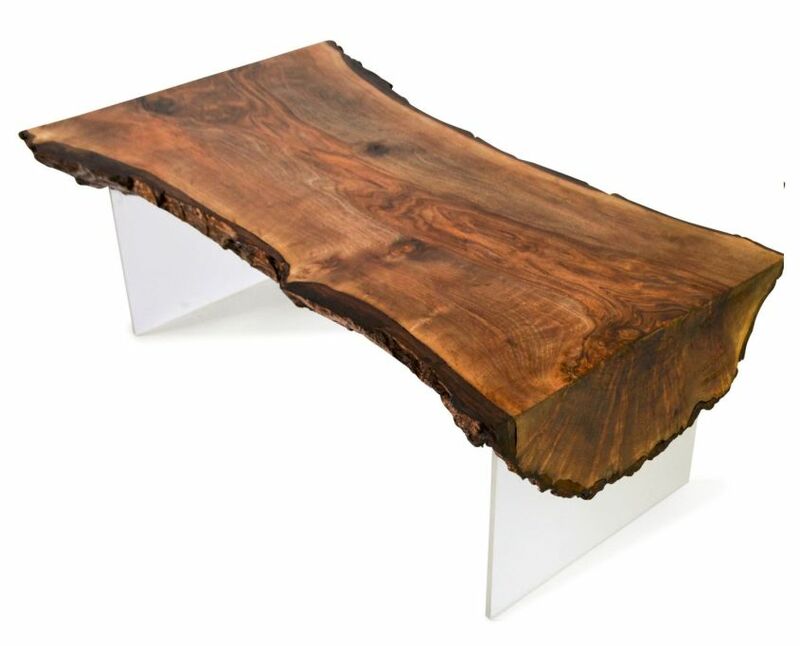 It is a modernist low coffee table that features a cross-cut hardwood slab tabletop sitting atop a white laminated cantilevered base. 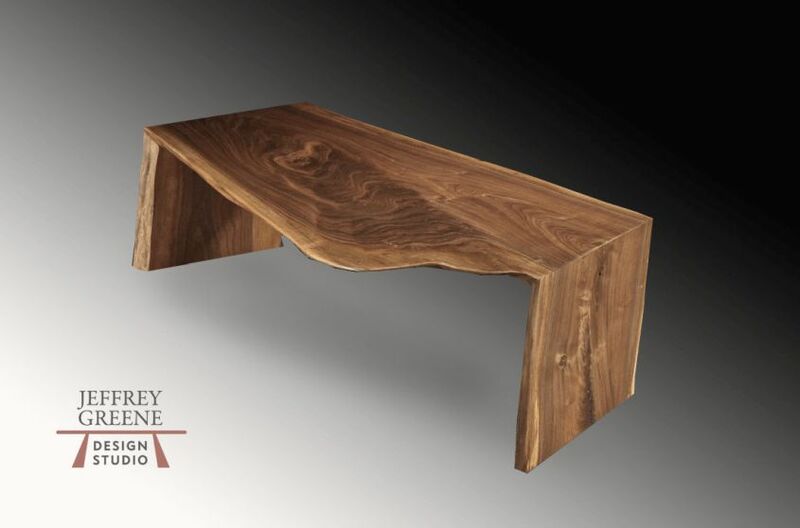 The mystical curves and uneven surface of the tabletop are some of its highlighting design features. 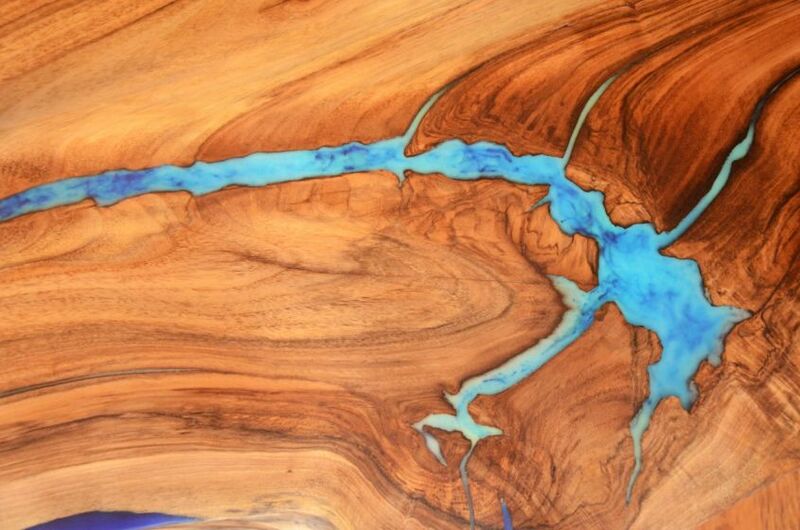 To depict the image of a thunderstorm, all cracks, knots, and holes in this coffee table are filled with glowing turquoise pigment. 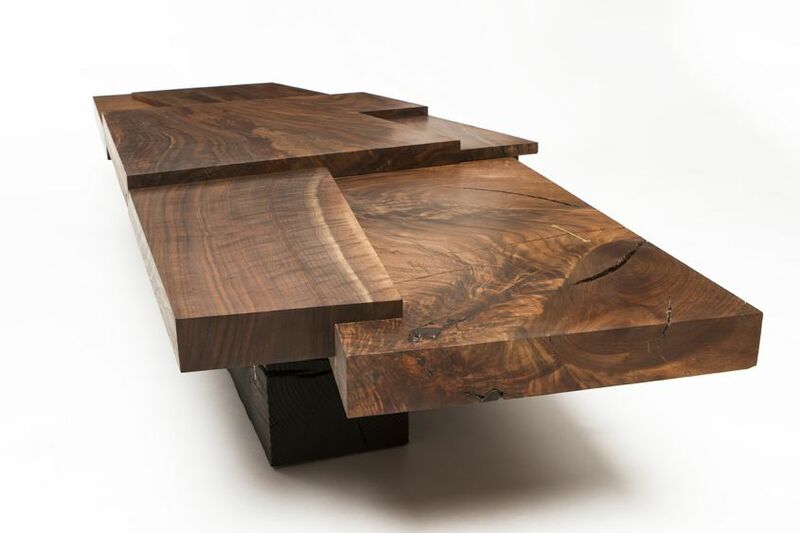 Its tabletop is made from a 5 cm-thick walnut wood slab that’s finished with tung oil and protected with lacquer. 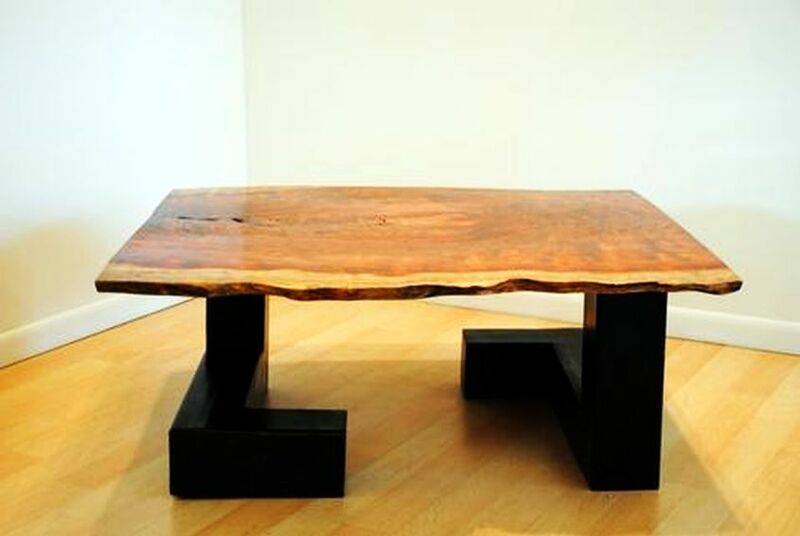 This custom made live edge coffee table boasts a large Bubinga slab tabletop that sits on a blackened steel tube base. 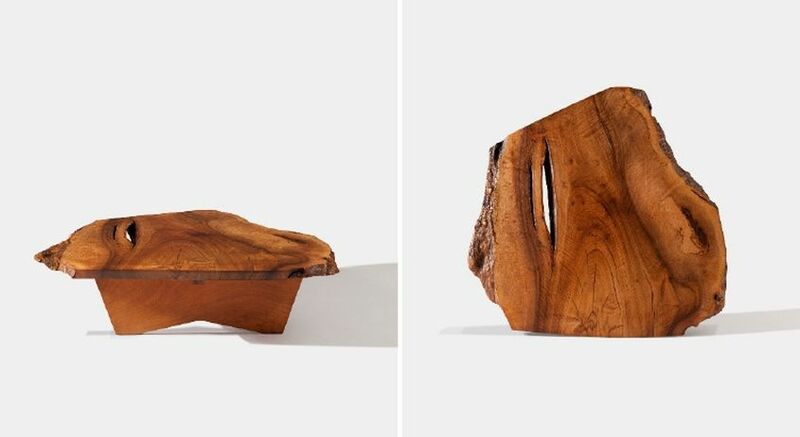 The two warm hues of Bubinga wood slab cheerfully create a rare aesthetic effect, making it a unique piece. 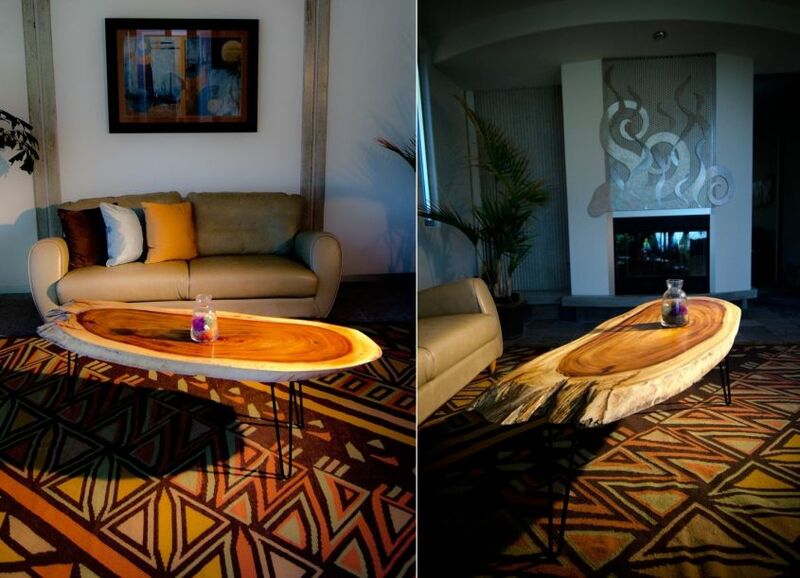 The Tavarua live edge coffee table is made from tree slice cut from a giant Guanacaste tree trunk. 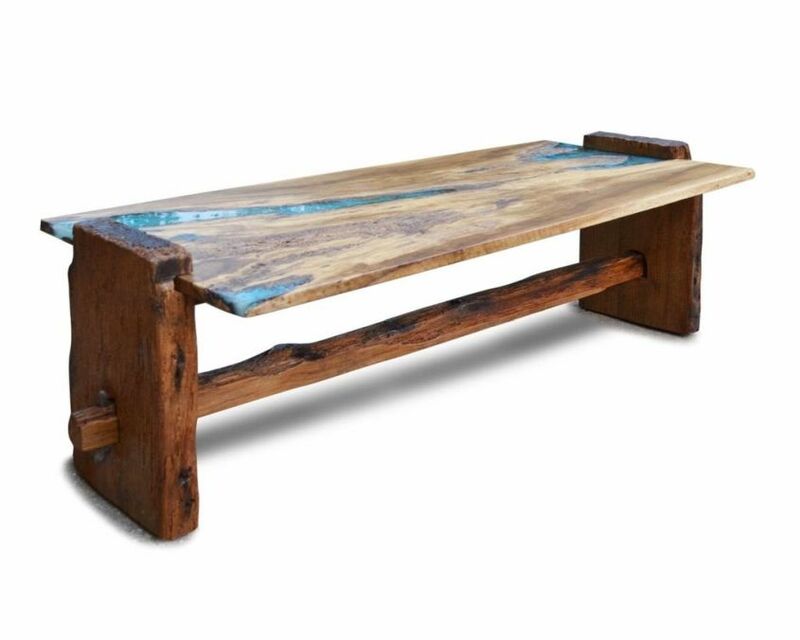 The Guanacaste or Parota wood tabletop boasts lives edges and is finished with a naturally boiled linseed oil finish to retain the natural beauty. 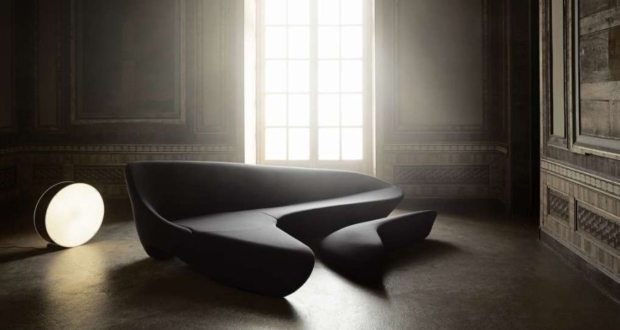 It is paired with hairpin legs for a simple yet elegant look that will suit any interior style. 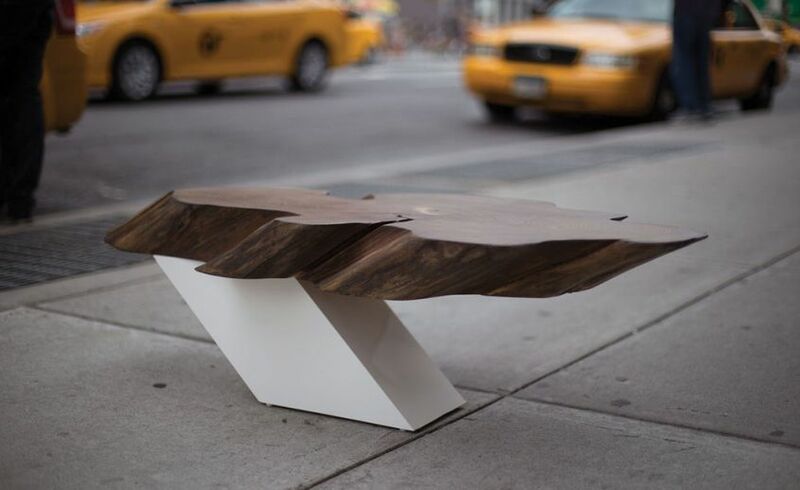 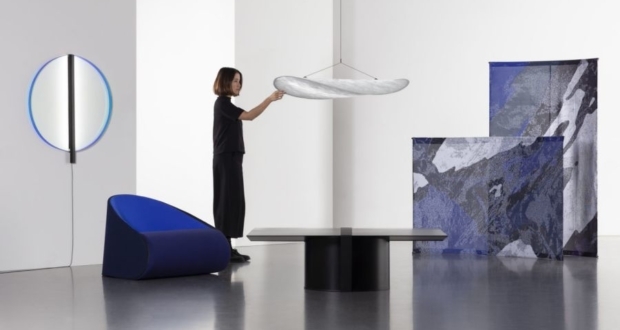 Made by Los Angeles based Taylor Donsker design studio, this unique coffee table consists of two independent halves featuring live edges and cracks. 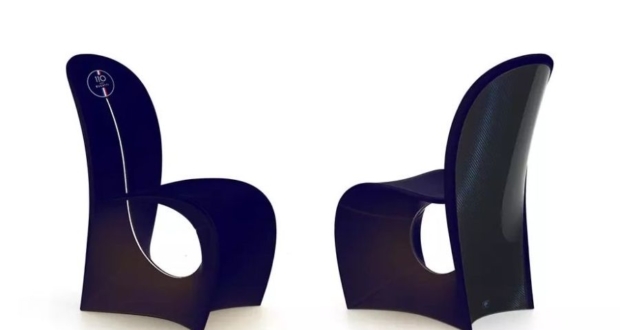 Taylor’s signature polished brass corsets add more fun to the tabletop and base while stabilizing cracks. 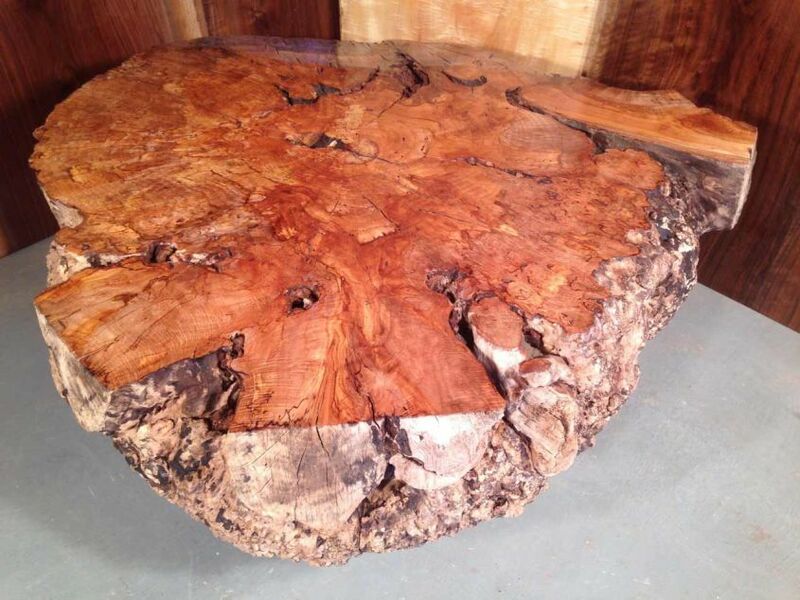 Mike Montgomery of Modern Builds YouTube channel has made this amazing live edge coffee table from a huge tree round. 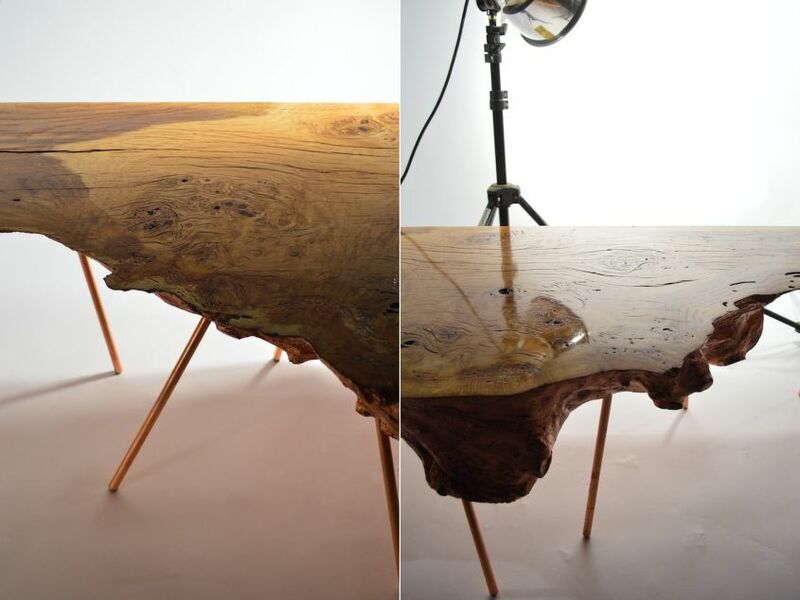 He used hairpin legs to incorporate some mid-century twist in the design, while finished the whole table with natural Danish oil. 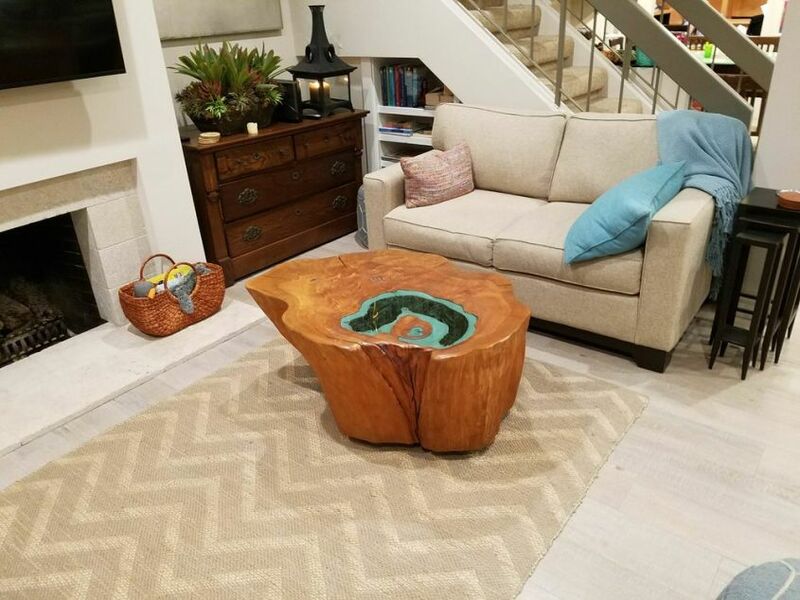 The natural curves and hues of Monkeypod tree trunk slices are great for showcasing at home. 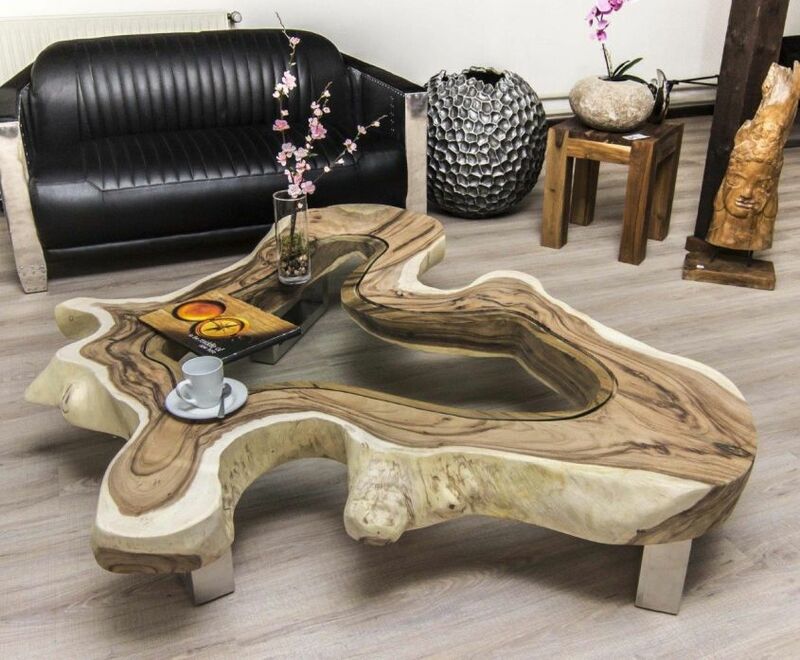 And when matched with a custom-built base, this coffee table can be a functional piece of art. 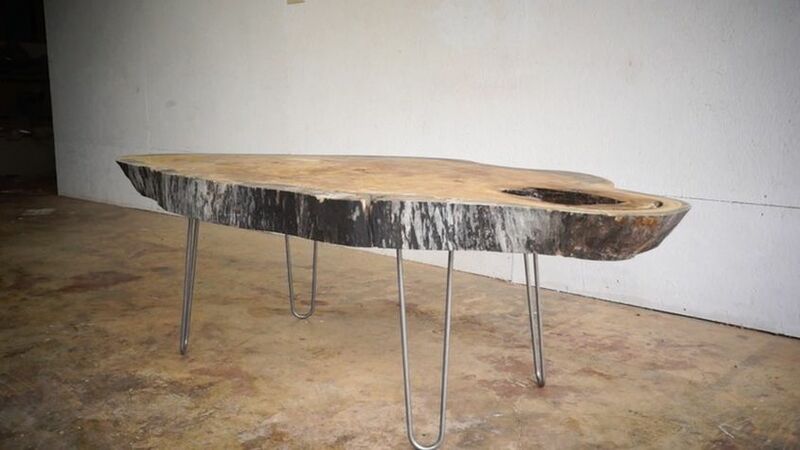 The huge cracks on the tabletop are filled with river stones and small indoor plants for a deep natural chic look. 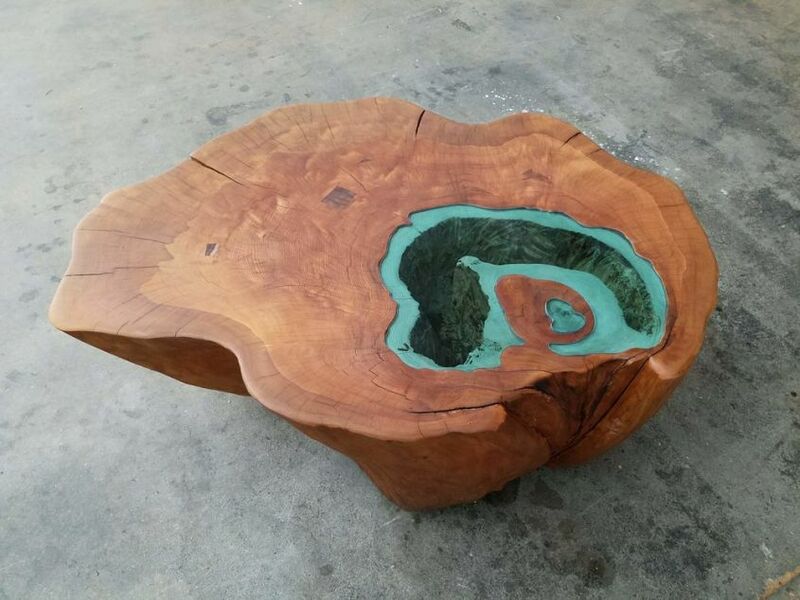 This coffee table is made from a huge white oak stump with varied irregularities that are packed with epoxy resin and turquoise chips to look like a water body. 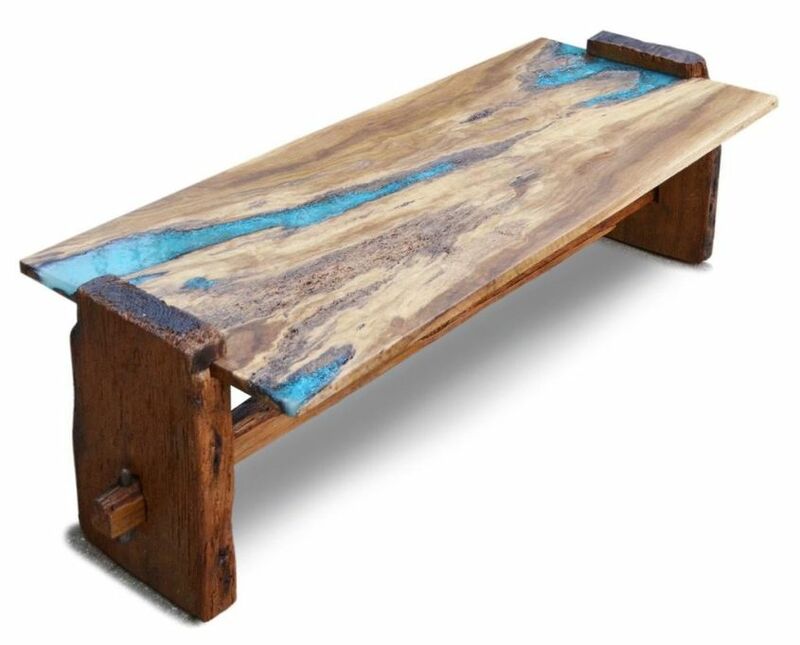 Thick pine wood slabs are used for legs, and there is also a driftwood stretcher. 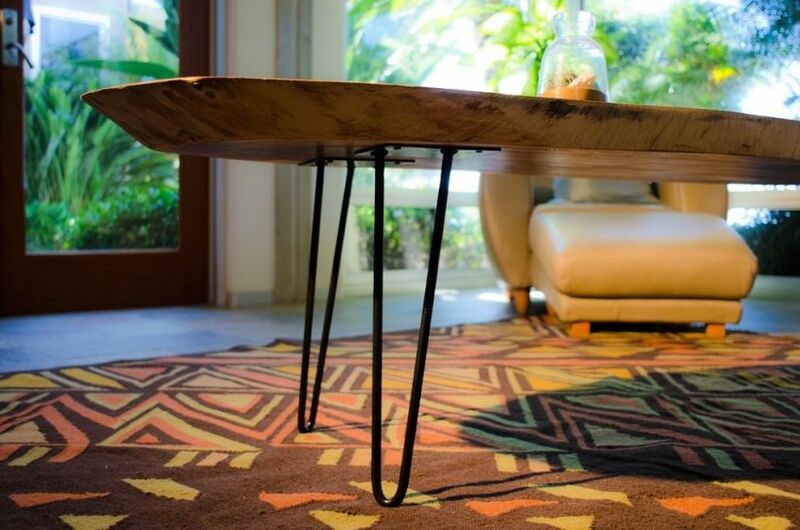 This unique coffee table consists of a half log tabletop sitting on a transparent Perspex base. 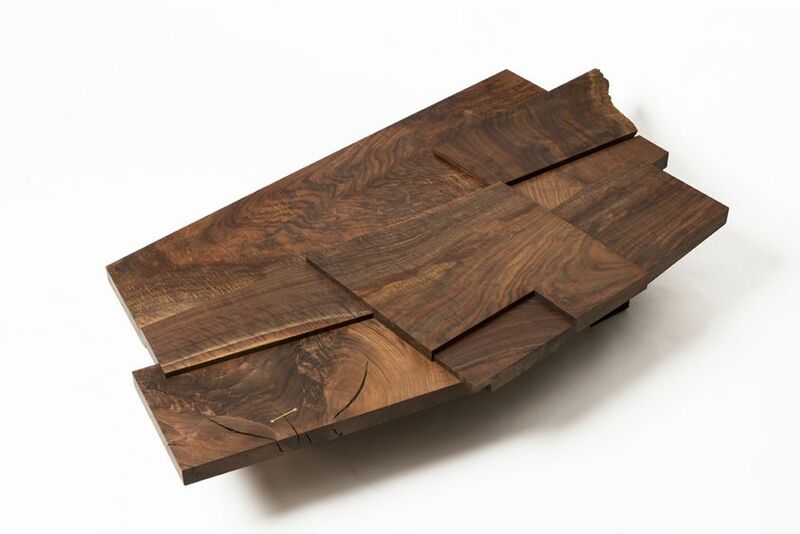 The rich golden and grey tones of walnut are perfect for a modern and contemporary look, while the untouched bark further improves the naturalistic aesthetic. 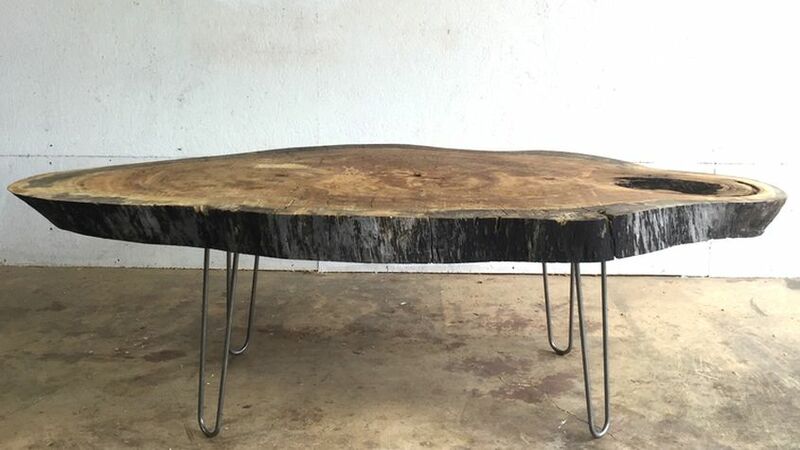 This designer coffee table made of a suar tree round with a wonderful width of over 170cm. 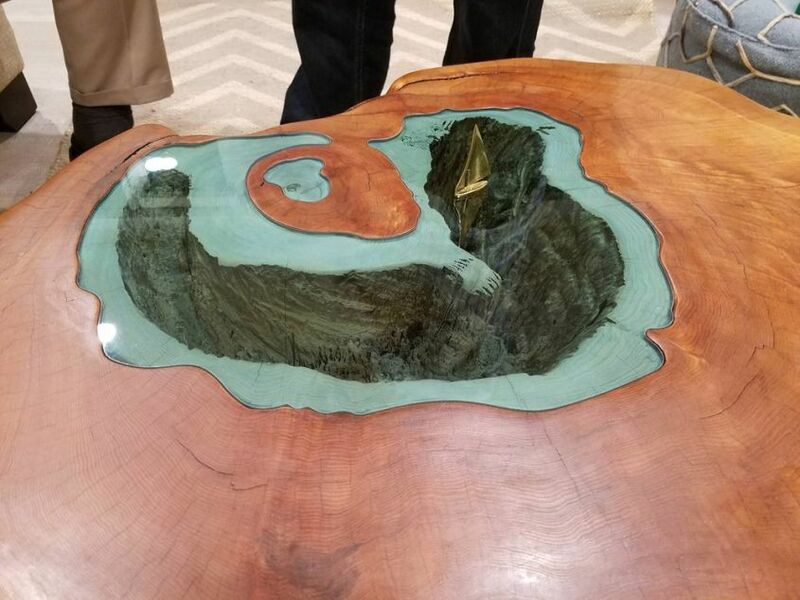 The big void in the center of the tabletop is decked with a glass insert. 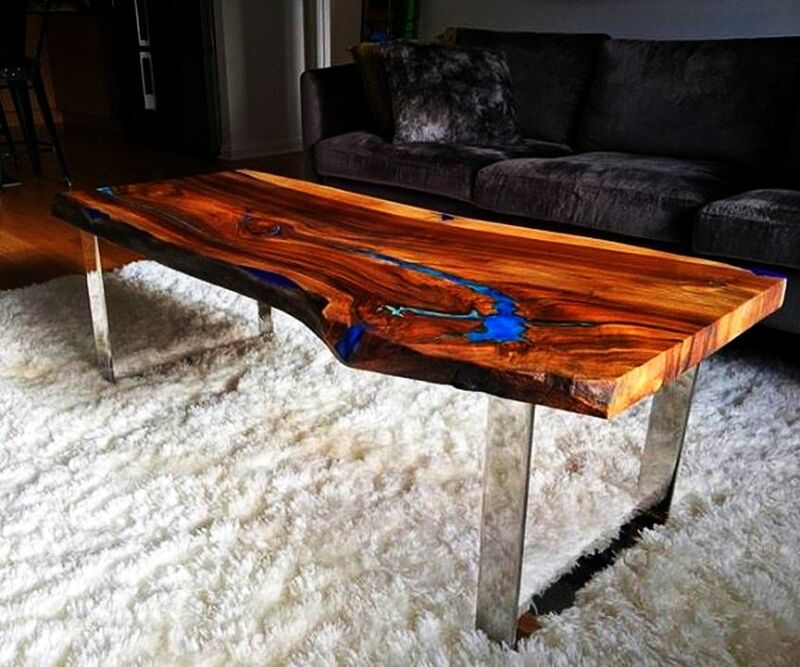 There are various options for table frame including solid wood and stainless steel. 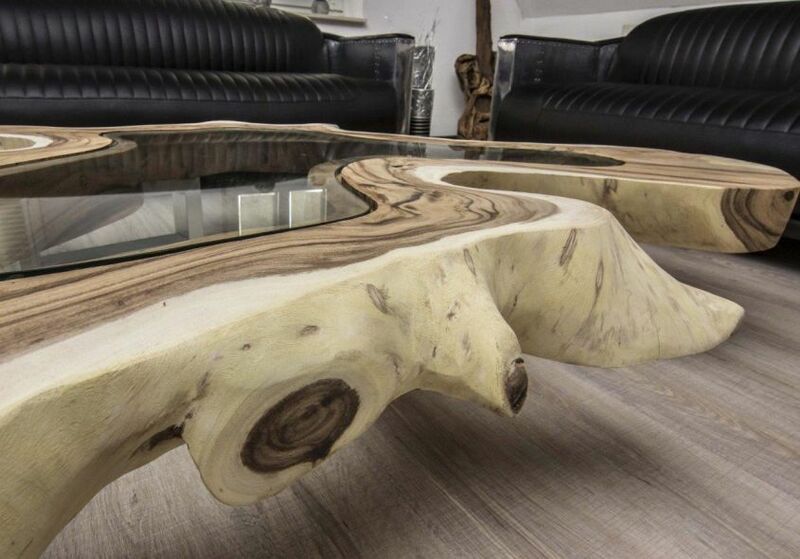 This coffee table showcases bright white to brown and black dark tones. 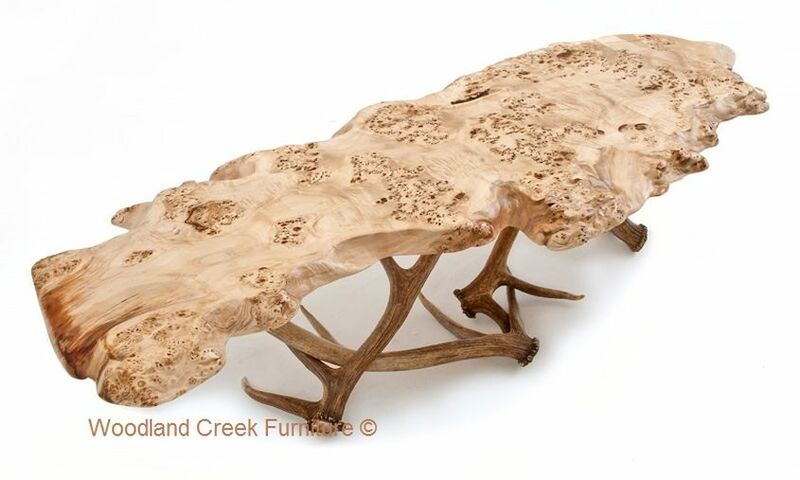 The real beauty of buckeye burl lies in its natural knots, which are strikingly showcased in this coffee table. 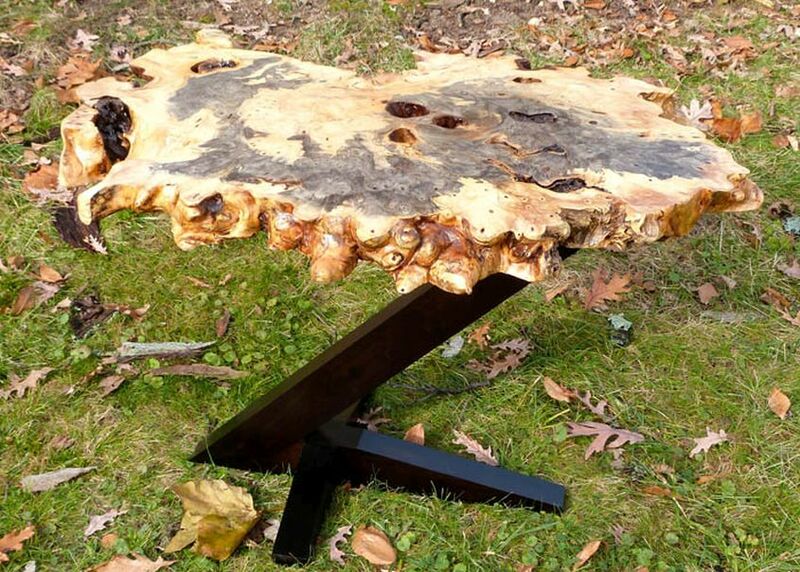 Its amazing form and grain patterns add more elegance to the live edge furniture piece. 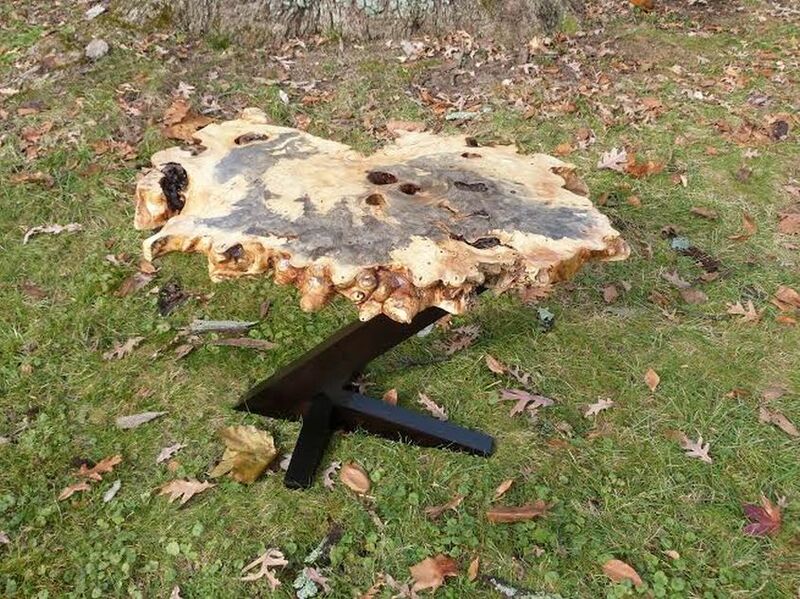 The burled tabletop sits on a cantilever maple base in black. 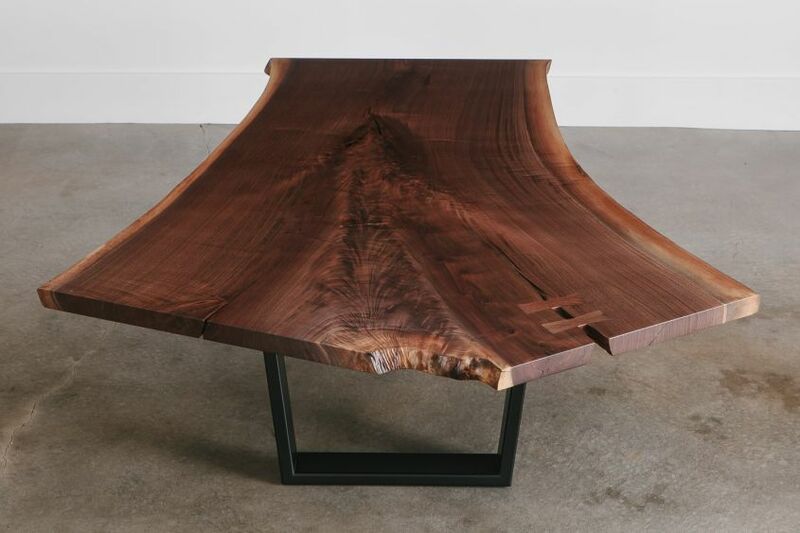 This live edge coffee table made from the cross-section of a suar tree, upkeeps all the wood’s natural curves and grain patterns, resulting in a one-of-a-kind furniture piece. 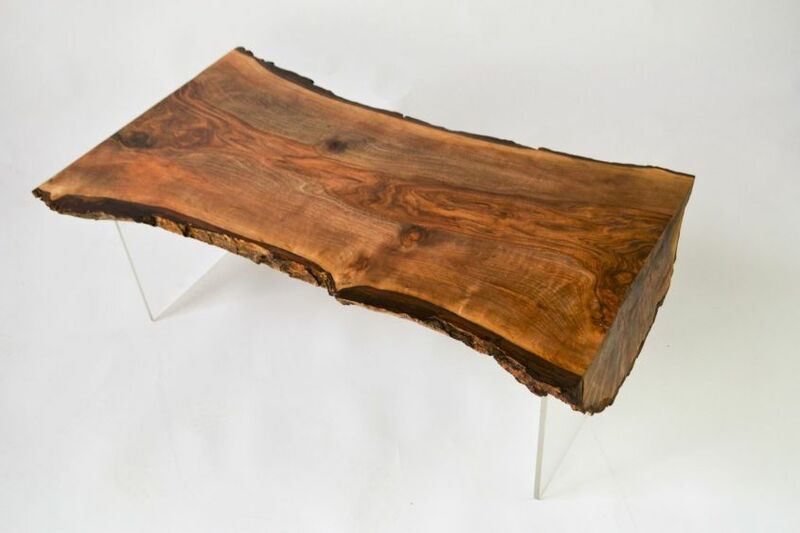 Standing on a single leg, It is a low coffee table that nicely shows the natural beauty of suar wood. 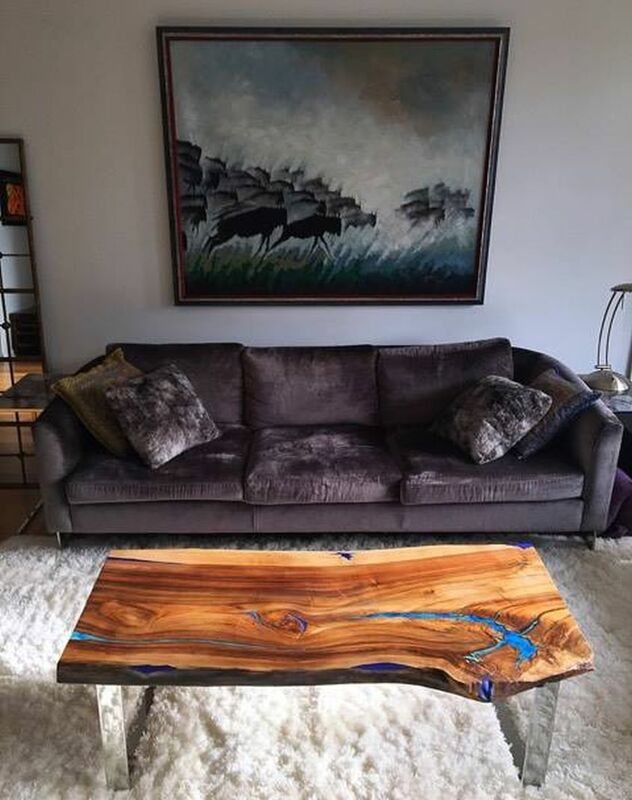 Made by Johnny Brooke of Crafted Workshop YouTube channel has made this coffee table from a live edge cherry slab. 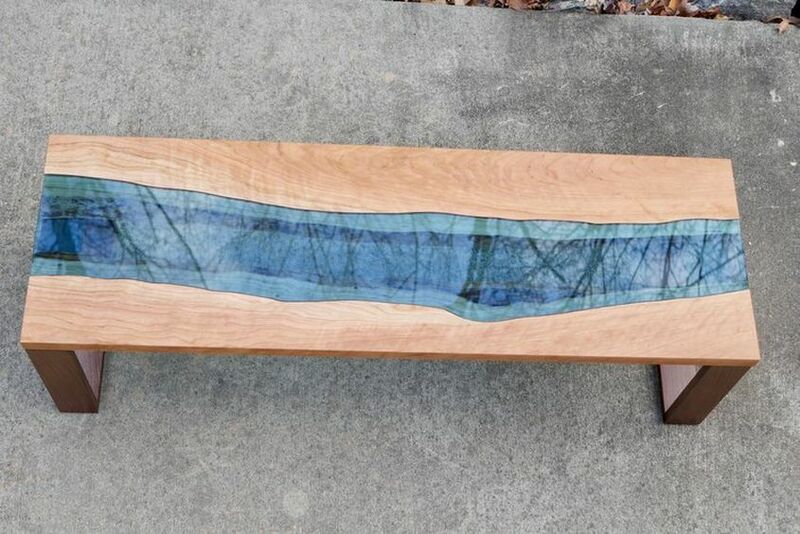 This simplistic coffee table has a bluish glass insert in the center of the two-piece tabletop to mimic a flowing river. 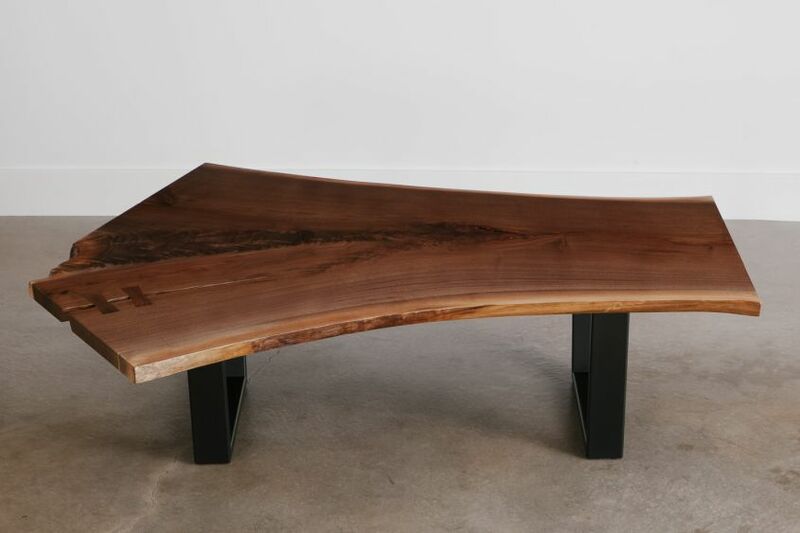 This gigantic maple burl coffee table is made by Paul Dumond who makes furniture inspired by the works of George Nakashima and Isamu Noguchi. 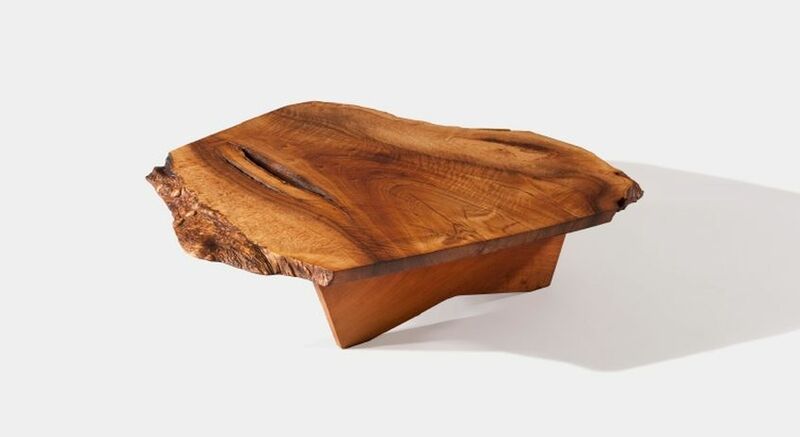 The burl slice tabletop sits on a strong criss-cross walnut base for stability. 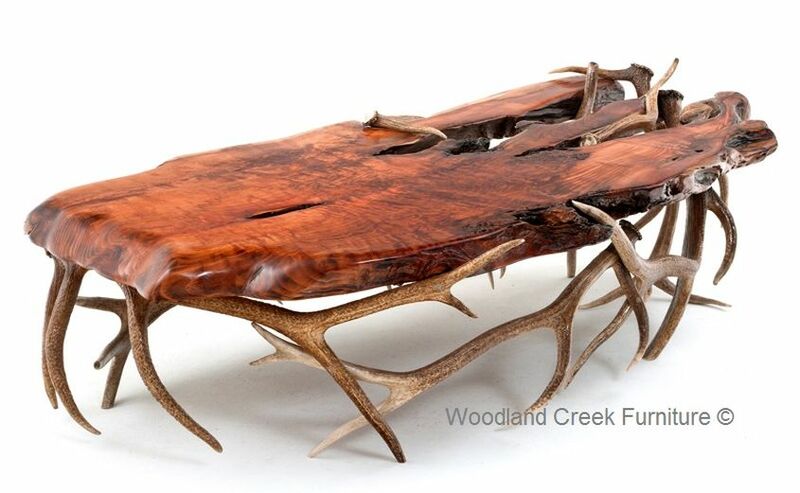 This coffee table comes in a redwood or burl slab tabletop, paired with a base made of naturally shed elk antlers. 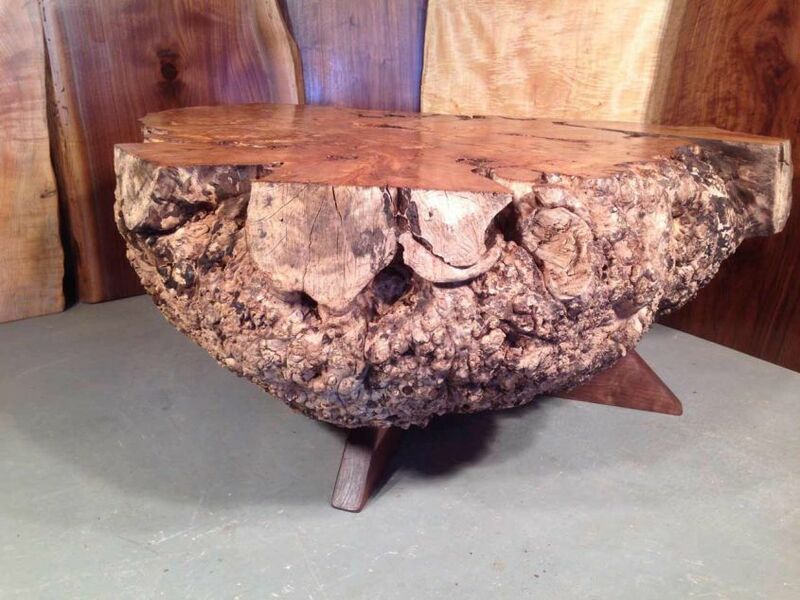 The table is full of rustic charm, nature’s beauty, and imperfections which makes it unique.